Reduce weed hosts. Floating row covers or other screening can be used to exclude the beetles during seedling establishment of high value crops. 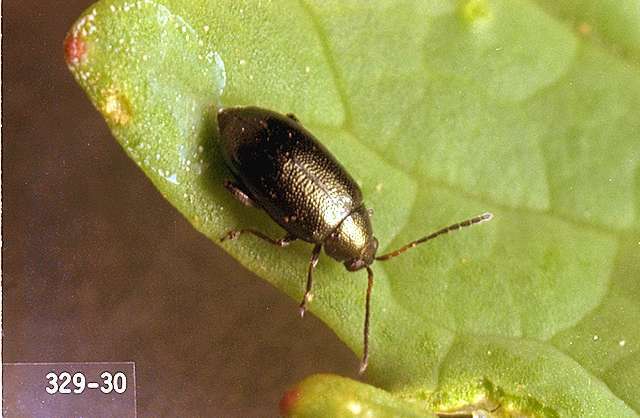 Flea beetles can be vacuumed off foliage, but this practice must be repeated frequently. Reinvasion of plants can be rapid. bifenthrin/zeta-cypermethrin (Hero) at 0.04 to 0.1 lb ai/a. PHI 21 days. REI 12 hr. Retreatment interval 21 days. Do not exceed 0.44 lb ai/a per season. Oriental radish (Daikon) only. carbaryl (Sevin) at 0.5 to 1 lb ai/a. PHI 7 days. REI 12 hr. Do not exceed 6 lb ai/a per season. Retreatment interval 7 days. deltamethrin (Delta Gold) at 0.018 to 0.028 lb ai/a. PHI 3 days. REI 12 hr. Retreatment interval 3 days. Do not exceed 0.14 lb ai/a per season. imidacloprid (Admire Pro) at 0.16 to 0.38 lb ai/a or 0.011 to 0.027 lb ai/1,000 row ft soil; 0.044 lb ai/a foliar. Do not exceed 0.13 lb ai/a foliar or 0.38 lb ai/a per season. PHI 7 days foliar, 21 days soil. REI 12 hr. imidacloprid (Provado, Prey) at 0.044 lb ai/a. PHI 7 days. REI 12 hr. One application per season. Do not exceed 0.044 lb ai/a per season. malathion (Malathion 8) at 1 lb ai/a. PHI 7 days. REI 12 hr. Retreatment interval 7 days. Limit 3 treatments. thiamethoxam (Actara) at 0.023 to 0.047 lb ai/a. PHI 7 days. REI 12 hr. Retreatment interval 7 days. Do not exceed 0.063 lb ai/a per season. thiamethoxam (Platinum) at 0.078 to 0.1 lb ai/a soil treatment. REI 12 hr. Do not exceed 0.063 lb ai/a per season. See label for recommended in-row application instructions.